The process of discovering who you are and what you are meant to do can take a lifetime or, as in the case of Steve Hoiles, your true calling can dawn on you during an “aha” moment. As an avid snowboarder (he’s from Canada) and surfer (it’s big in Vancouver, B.C.) it made sense that he would own a surf and snowboard shop. But that wasn’t his calling. It turns out that, yes, surfing was, and is, one of his passions but not his life’s work. His other passion—architecture—was his real craft. 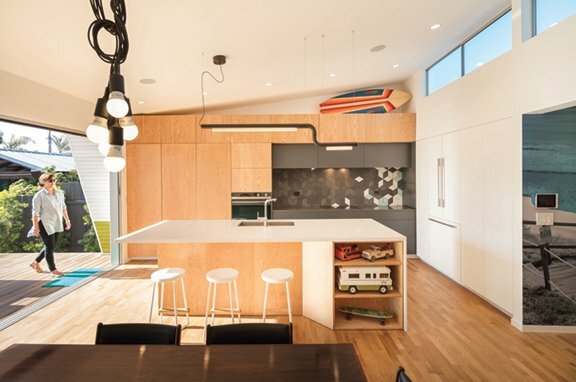 His first design project was renovating that home in Canada. He says he started rough and made some bad design decisions but didn’t give up. He surrounded himself with forward-thinking architects whom he admired and who were “good at what they did,” and he hired them as consultants. He learned along the way—and the word “can’t” wasn’t part of his vocabulary. Steve asks his wife Liz to join him for a late afternoon snack at the backside of the house where sliding glass doors infuse the living spaces and master bedroom in natural light. 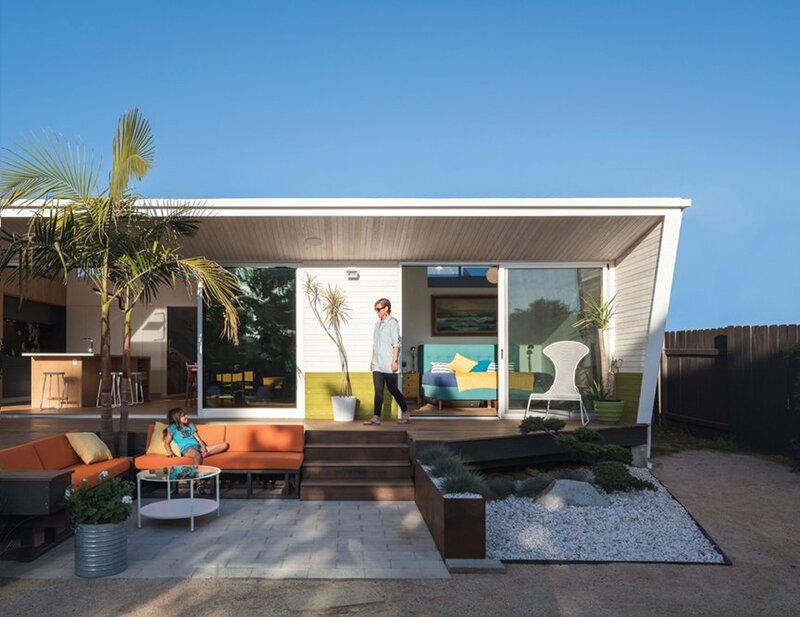 As of this date, he’s designed 11 homes through his business Surfside Projects, beginning with residences in Vancouver and, later, residences in Southern California. 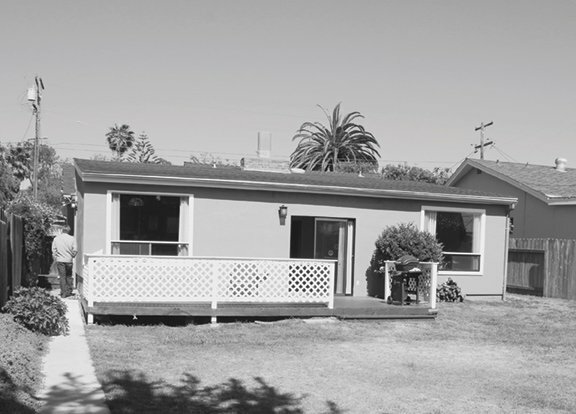 One of those houses, a development project in Encinitas, ended up becoming his own home in 2012. It’s where he and his wife Liz, an industrial designer, and their two daughters, 11-year-old Keiko and 9-year-old Hana, still live. 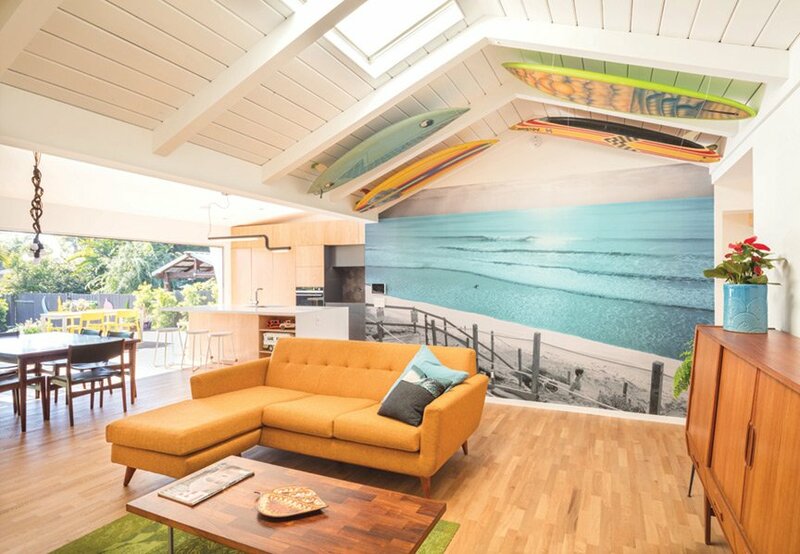 A photo Steve took of Swami’s, a surf spot that embodies the beach culture of Encinitas, was colorized and blown up to make the perfect living-room backdrop that symbolizes the laidback spirit of the house and the community it’s in. Steve and Liz liked the 1957 house because it had some “funkiness” to it. 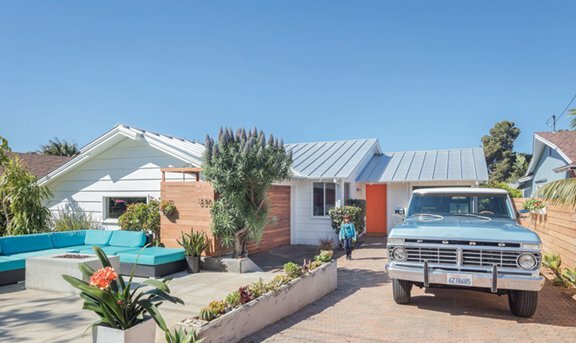 And it didn’t hurt that the 1,698-square-foot, three-bedroom dwelling on a cul-du-sac of cookie-cutter-but-cute cottages was two blocks from the Pacific Ocean. Steve’s remodel of the home showcases his love for modernist SoCal architect Richard Neutra design aesthetics—spacious and compact, functional and open, streamlined and simple—as well as his endearment for the architecture of Cliff May whose mid-century modern ranch houses were about informal, relaxed living indoors and out. 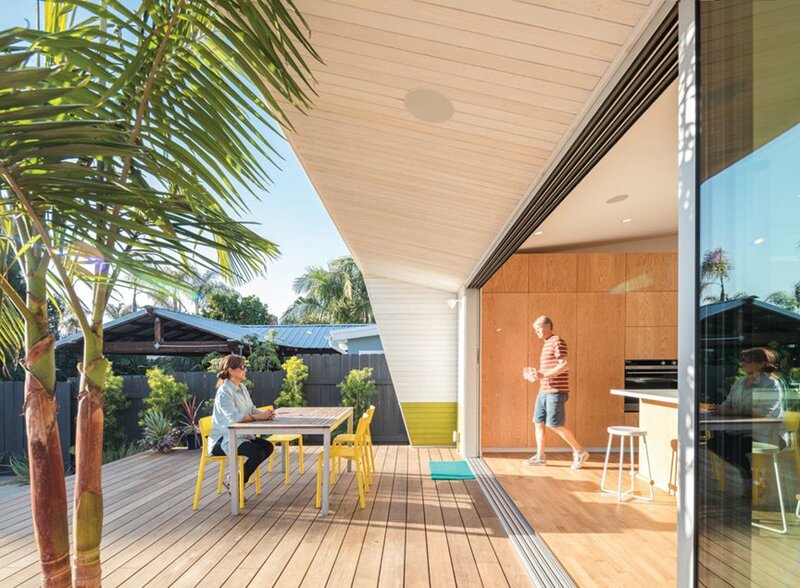 The exterior dining space becomes an extension of the kitchen through floor-to-ceiling sliding glass doors that blur the boundaries between indoors and outdoors. 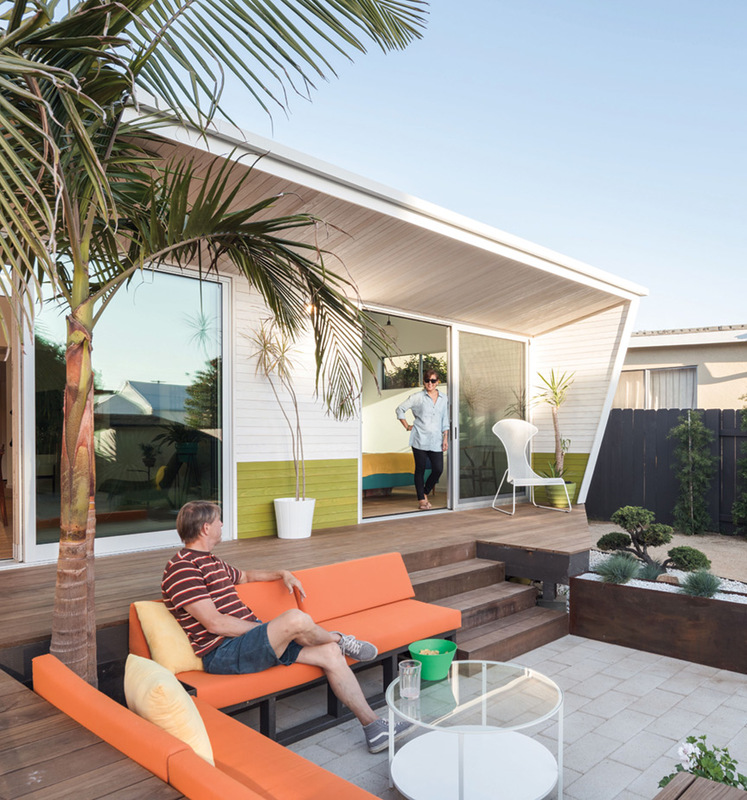 Since the home’s modest size was part of its character, Steve opted not to add any square footage. 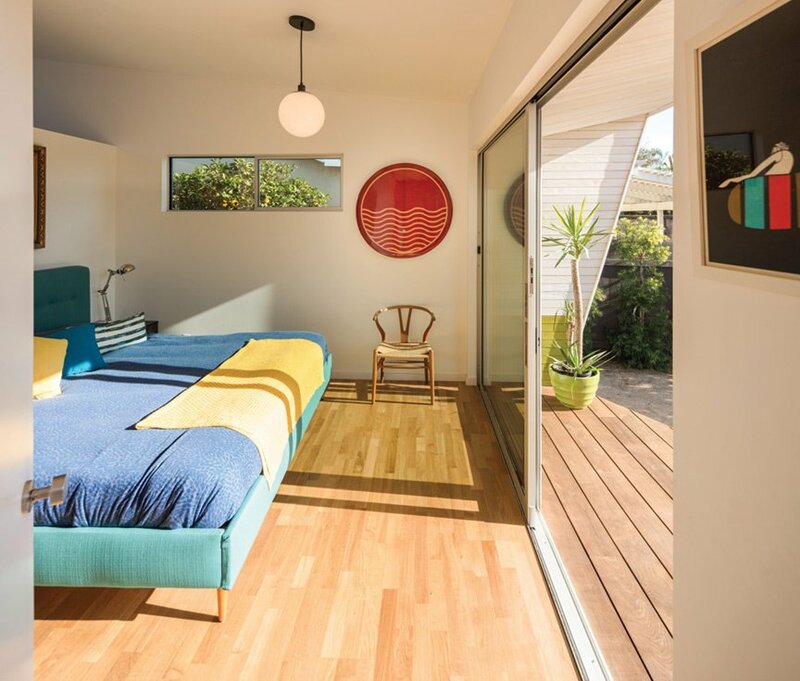 Instead, he kept the original two-bedroom, one-bathroom structure on the front-half of the house (“ironically, it was in better condition than the newer addition”), tore the newer back half of the house down and redesigned the residence using the same slab. 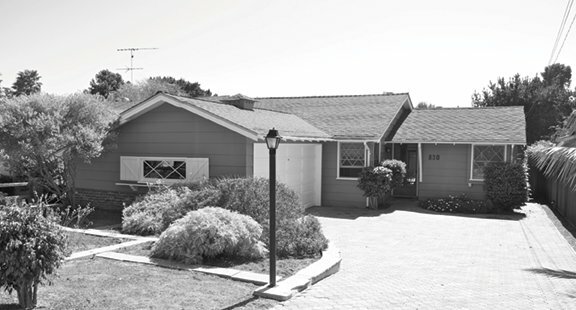 In this old-meets-new metaphor, the original kitchen became a home office that, when needed, morphs into a guest bedroom; and the original vaulted-ceiling living space at the front of the house along with the ’60s added-on sunken family room became a no-walls kitchen-dining-living space that embraces the outdoors by the addition of floor-to-ceiling sliding glass doors that open onto a new deck. Rhombus-shaped tiles in the backsplash have five varying textures. The flexibility of layouts from this one shape creates an interesting mosaic artwork for the wall. Another full sheet of glass at the deck expands across the master bedroom, where it slides open to give the bedroom an indoor-outdoor ambiance similar to the great room. This third bedroom, originally small and not worthy of the title “master” bedroom, now rates that designation. Not only does it welcome the outdoors in but, by taking some space from the old sunken family room, it includes the happy addition of an adjoining bathroom and walk-in closet. 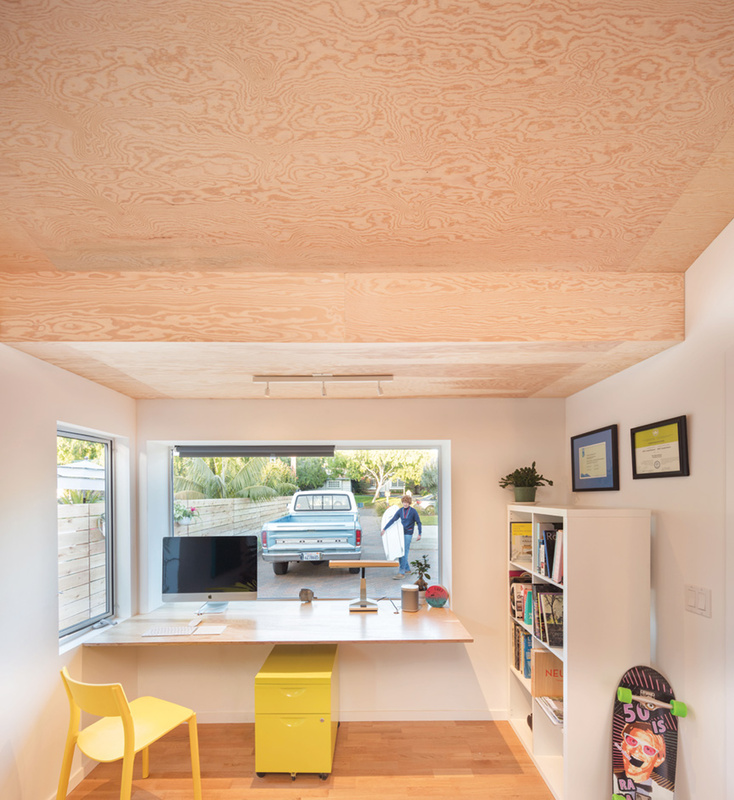 For example, Steve’s idea to sandblast the exterior Douglas fir siding raised the grain so that when it was whitewashed, it gave the façade an unusual, interesting texture. He also chose marine-grade plywood sheets, taken right off the lumberyard shelf, for the home-office ceiling and master bathroom and kitchen cabinet doors. While the footprint remains the same, passive designed overhangs, thoughtful use of natural wood, an abundance of natural light and a simple, open plan now define the updated home, which has a more modernist take. 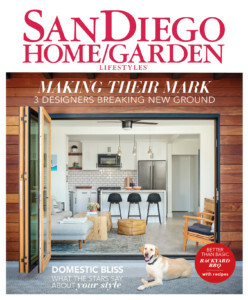 Or like the extensive use of Palm Springs Gold decomposed granite as ground cover that ingeniously transforms the xeriscape backyard, just beyond the deck’s dining space and outdoor sunken living room, into a Southern California campground. 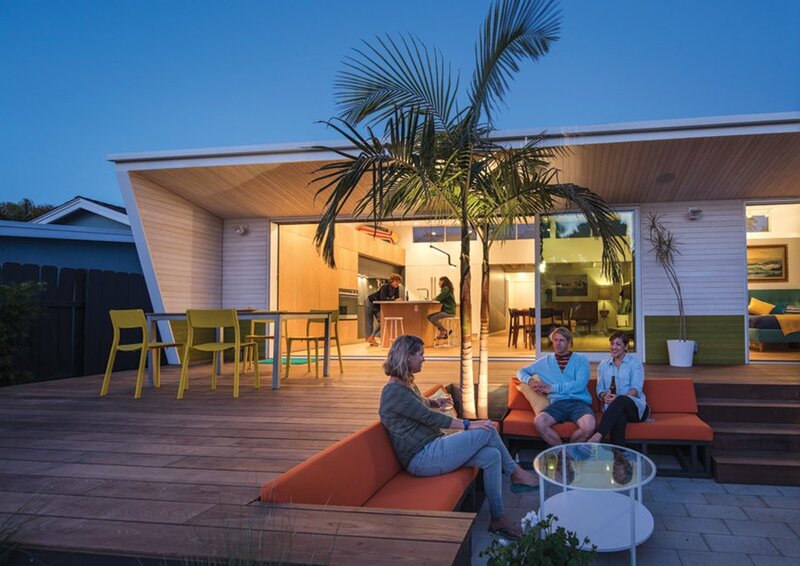 In the evening, friends and family love to gather in the comfort of the backyard and, as night closes in, everyone (well, almost everyone) gathers around the “campfire” in an area that was designed to mimic the look of local state beach campgrounds. Xeriscaping reduces the home’s water usage.